Renting in the Tri-State area: What does $2,400 get you? Curious just how far your dollar goes in the Tri-State Area? We compared what $2,400 might get you in New York City, Queens, Bronx, New Rochelle and Hempstead, using data from rental site Zumper to present a snapshot of the area's rental landscape. New York City -- 35-17 210th St. This three-bedroom, one-and-a-half-bathroom apartment is located at 35-17 210th St. in New York City's Bayside neighborhood. Asking $2,400/month, it's priced 38 percent below the $3,850 median rent for a three bedroom in New York City. In the unit, expect to find hardwood floors, a spacious closet, granite countertops, wooden cabinetry and ample natural light. Pet owners, inquire elsewhere: this spot doesn't allow cats or dogs. According to Walk Score's assessment, the area around this address is friendly for those on foot, is relatively bikeable and offers many nearby public transportation options. Next, there's this three-bedroom, two-bathroom apartment situated at 60th Street & 67th Avenue in Queens' Ridgewood neighborhood. It's also listed for $2,400/month--25 percent less than Queens's median three-bedroom rent of $3,200. The apartment features hardwood flooring, central heating, high ceilings, a dishwasher, a walk-in closet, stainless steel appliances, exposed brick and a breakfast bar. Cats and dogs are not permitted. According to Walk Score, the surrounding area has excellent walkability, is bikeable and boasts excellent transit options. 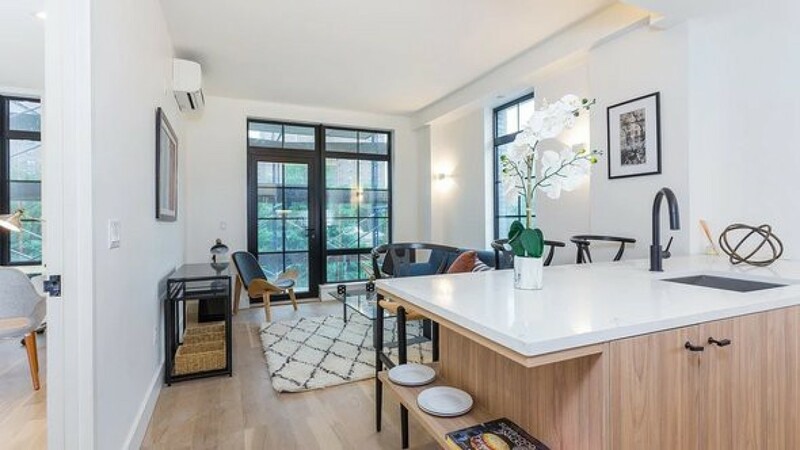 Listed at $2,400/month, this 580-square-foot studio apartment at 27 Bruckner Blvd. in the Bronx's Mott Haven neighborhood is 60 percent higher than Bronx's median studio rent of $1,500. In the unit, you'll get hardwood floors, high ceilings, a dishwasher, a walk-in closet, stainless steel appliances, floor-to-ceiling windows and a balcony. The building offers on-site laundry, outdoor space, a swimming pool, a fitness center, a roof deck, an elevator, storage space, secured entry, on-site management and a residents lounge. When it comes to pets, both meows and barks are welcome. Walk Score indicates that the surrounding area is extremely walkable, is convenient for biking and boasts excellent transit options. New Rochelle -- 104 Winthrop Ave.
Next, here's a 959-square-foot three-bedroom, one-bathroom apartment at 104 Winthrop Ave. in New Rochelle, listed at $2,400/month. That's 20 percent less than New Rochelle's median three-bedroom rent of $3,000. The unit features hardwood flooring, air conditioning, a dishwasher, granite countertops, stainless steel appliances, recessed lighting and large windows. Pet owners, inquire elsewhere: this spot doesn't allow cats or dogs. According to Walk Score's assessment, this location is friendly for those on foot and has good transit options. Finally, check out this two-bedroom, one-bathroom apartment at 451 Fulton Ave. in Hempstead. It's listed for $2,387/month, which is nine percent pricier than Hempstead's median two-bedroom rent of $2,200. Apartment amenities include hardwood floors, a walk-in closet, stainless steel appliances, marble countertops and wooden cabinetry. The building offers on-site laundry, outdoor space, an elevator, a residents lounge and on-site management. Pet owners, inquire elsewhere: this spot doesn't allow cats or dogs.